It’s spring! It really is (no matter what the calendar says), because my freesias and irises are blooming, and the kowhai have emerged in a mass of glorious golden yellow. Spring is my favourite time of year: all that hope of warmer weather, and all of summer and the nice days of autumn to look forward to. And then there are spring and summer fashions to think about: cute transitional jackets, glamorous holiday dresses, flirty summer frocks, maybe even something for the summer weddings! 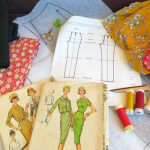 For spring, I’ve scheduled a mix of my most in-demand classes like Intro to Knits & Perfect-Fit Trousers, and some fun celebratory classes with a vintage focus, like the ’50s Inspired Wiggle Dress, and the ’20s & ’30s Gatsby & Garden Parties Frock. To register for any of these classes, please e-mail Leimomi with your name, a contact number, and the name of the class you would like to be in as the subject line. In October, join me for Intro to Knits: The Simple T-Shirt. Sewing with knit fabric is a different skill to woven fabrics, but it’s really easy to master, and this class will teach you how to make tees that look better than the ones you buy in the shops. Intro to Knits runs Monday evenings 14 & 21 October. If you are looking for something a little more challenging, sign up for Perfect Fit Trousers and learn how to draft your own trouser block, fit trousers, and finish them professionally. 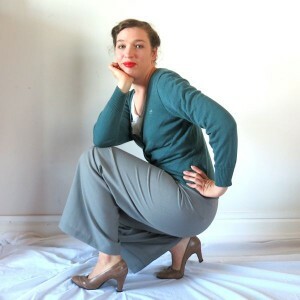 A previous student described her trouser block as the only pattern she’ll ever need! Perfect Fit Trousers runs Thursdays in Nov & early Dec, with a break on the 28th Nov.
One of the big vintage looks that has made the leap from vintage classic to hottest modern trend is the wiggle dress: the slim, shapely dress which uses a waist seam and multiple darts to show off your figure to perfection. 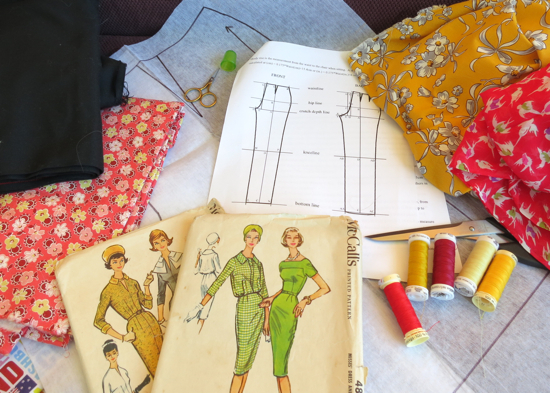 In The ’50s inspired Wiggle Dress Class, you’ll learn how to fit a bodice and skirt on your figure perfectly, and how to adapt a pattern for a better fit, and a custom look with a personalised neckline. The Wiggle Dress Class runs Wednesdays 13-27 Nov, and 11 & 18 Dec, with a break 4 Dec.
Another vintage look that is also extremely on-trend is the late ’20s inspired drop-waisted dress made famous by the Great Gatsby (which is actually set in the early 1920s, but costume designers always ignore that bit 😉 ). 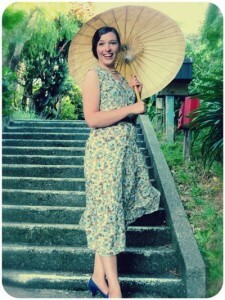 In the ’20s & ’30s Gatsby & Garden Party Class you’ll design a period inspired frock, and take a basic late ’20s bodice block with a dropped waist, and learn to make adjustments to the bodice to match your design, and how to draft a skirt. Channel a flapper with beads and sequins in a soiree ready frock, or go for a sweeter design with soft florals for the ’30s Garden Party look. The class runs Mondays 18, 25 Nov & 2, 9 & 16 Dec.
As always, there are Absolute Beginners classes happening every five weeks. They are a great intro to sewing, and make a fantastic present. 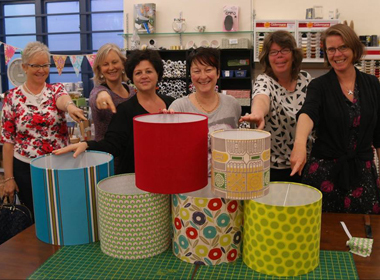 Absolute Beginners sewing sessions always book out and have a wait list. October is almost booked out already, but there are still spaces available in November’s class. If you are a little beyond Absolute Beginners, but want a refresher in some basics, we’re offering Sewing Refresher courses in Zippers, and Buttons on Tuesdays in December. 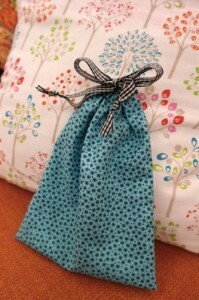 They are the perfect classes for someone who has sewed in the past, but is feeling a bit rusty.